What is Dermaplaning – Advanced Exfoliating Facial? Dermaplaning is a safe, simple and effective method of exfoliating the skin, removing dead cells from the epidermis, and also the fine vellus hairs (known as peach fuzz). 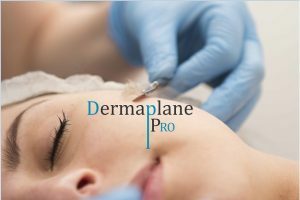 Dermaplaning is a mechanical exfoliation performed by a professionally trained skincare professional using a sterile, surgical scalpel held at a 45 degree angle. Dermaplaning is sometimes called facial shaving but there is a lot more to it, and unlike dermabrasion, which it is often confused with, it is far quicker and has few to no adverse effects. Dermaplaning’s purpose is to give your skin an immediate exfoliation for a luminous glow, dewy skin, faster cell turnover, and a smoother texture. It also allows any products you apply after to penetrate deeper. This means that makeup can be applied with far more ease and precision, and overall has a far better finish. Clients having this done are typically looking for skin rejuvenation, reduction in the appearance of fine lines or wrinkles. Although relatively new in the UK, Scotland and Glasgow, dermaplaning facials have been used for many years in the States and are hugely popular with celebrities, esteticians and makeup artists. Dermaplaning is a painless procedure and our clients have found it very relaxing. Standard treatment begins with a skin cleanse, then your skin is prepped. We then begin the Dermaplaning process using the surgical scalpel to remove the dead skin and vellus hair from the face and neck. After this an enzyme is applied which helps remove dirt and unblock pores. The treatment is completed with a moisturiser to suit your skin type and an SPF to protect your skin from UV damage. Deluxe treatment is an extended version of the Standard Dermaplaning. After the Dermaplaning treatment we will apply a firming, hydrating or soothing mask which will help to further your results. While this is working you can lie back and enjoy a pressure point massage. This is the ultimate in relaxing facial treatments with the added bonus of younger, healthier skin. A: No, it grows back as soft as it always was, you will not feel the hair growing back. A: No, not in the slightest. Q: How many treatments until you see results? A: You will see results immediately after the first treatment. Q: Do I need to take my makeup off before the treatment? A: We recommend you do to get the best results. We do have cleanser to do this however it’s most effective on already bare skin. Q: How often can I have the treatment? Q: How long before my holiday can I get Dermaplaning? A: We recommend 2 weeks. Q: Can I have this treatment when I’m pregnant? A: Only if you have had this treatment previously. Q: Do I need to do anything before the treatment to prepare? A: You must not have used any products containing Salicylic Acid or Glycolic acid in the 3 days previous to your treatment. You must also not have had any chemical peels within a month of Dermaplaning. Stop Retin-A products for 5 days prior. Avoid laser treatments 4 weeks before treatment. No waxing 7 days prior to treatment. Q: Can I have this treatment if I have acne? A: If you have active acne or are on Roaccutane you will not be able to have the treatment however if you have old acne scarring then it is still possible to have Dermaplaning done. PLEASE CALL US NOW ON 01786 831 164. OR FOR ANY FURTHER QUESTIONS PLEASE CALL US AND ASK FOR PAULINE OR LORRAINE.